The Hapalua. Don’t Run too Far… and Eat More Carbs » Use Exciting in a sentence. What’s a recipe for gaining weight? Less cardio and more carbs. That’s what I’m doing as part of an experiment at the moment. 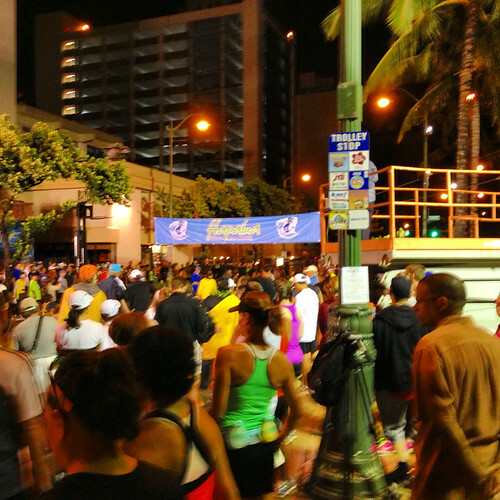 Sunday, March 10th, marked the 2nd annual Hapalua Half Marathon here in Honolulu. Last year, I was injured from the marathon and couldn’t participate, but this year, I decided to give it a go since I probably won’t have enough time to train for the Honolulu Marathon happening in December. It takes place the 2nd Sunday of December, and I believe that also correlates to finals week. I’ll be taking some hefty subjects, so I’d rather not train for a marathon next semester. I’m trying something that Kirstyn suggested — which is to increase carb intake all week, to ramp up my metabolism. Starting next week, I’ll then cycle from high, to medium, and then low carb days. The cycle will last 3 days and then just keep repeating. Along with the new diet, will be some alteration to my cardio regimen. With distance running, I always had to carbo load a couple of days in advance. I also seemed to lose muscle mass after my really long runs. I lost both fat and muscle, but I want to keep the muscle on me, and only lose the fat. So, my cardio will no longer consist of multiple 1 hour run-days, with a 10+ mile run on the weekend. Instead, I’ll be doing 30 – 45 minute sessions of cardio, three times a week, with a 1-hour run on the weekend. The short cardio sessions will consist of stairmaster, or treadmill HIITs workouts, etc. I’ll also be lifting weights 3 times a week (as I currently do). Hopefully, this will help me to become more lean. I’ll post how it goes in about a month or so… or if anything special happens. As for the Hapalua this past weekend, it was pretty awesome. It poured hard right before the start, so we were all drenched before the 6 AM start time. Personally, I loved it. Never, have I ever, run in so much rain. It felt pretty neat, and nostalgic. Like when I was a kid, and would jump (or accidentally ‘fall’) into the swimming pool with all my clothes on. My shorts and t-shirt, which were both naturally baggy dry, started soaking up the water, and I had to pull my shorts up every so often, but it was still a good time. The course, started at the Duke Kahanamoku statue in Waikiki, went west towards downtown, and then turned back around to head east near Aloha Tower. We ran along King St., then back onto Nimitz, into Waikiki and up to the zoo-side of Kapiolani Park. Then the Monserrat Avenue hill came. And, man. I’m used to running around Diamond Head in the other direction, so the incline I deal with is the one by the lighthouse… Personally, I found the Monserrat way to be a lot harder. The incline felt so sustained as we all made our way up Monserrat, all the way to Kapiolani Community College, where it finally leveled-out. For the first time ever, I experienced leg cramps while running after passing the 11-mile mark. Both calves felt like the muscles inside were spasming, and at times, my legs were shaky. But, I ran through the pain. My achilles were also feeling pretty tired. I really pushed myself since I knew this would be my last race. I came in just under 2 hours and 30 minutes, which is a pretty good performance for me. (I am slow). I’m glad I did this run. I debated skipping it, but it was n enjoyable experience. Today, I felt some DOMS setting in on my quads. My right knee was feeling really weird after the run yesterday, but has been better today. I don’t think I sustained any real injuries this time. Hooray! Thanks to everyone who wished me luck, or congratulated / encouraged me in my last long run! This entry was posted in diet, fitness, food, races, running, workout routines and tagged building lean muscle, carbs, diet, long distance running muscle loss, losing fat. Bookmark the permalink.